Things you need to know....!!! 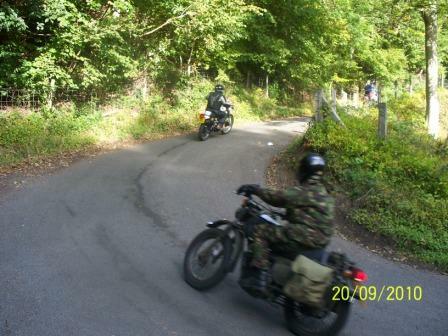 South Durham VMCC took over the running of the Beamish in 2008 from Durham Classic Motorcycle Club. The trial didn't run in 2007, sadly. Average entry over the years was 170 per year/event. This is much less now, with average of about 120. Most of the marshals were Friends of Beamish until they ceased running event in 1998 when they handed over to Durham Classic Motorcycle Club with N.Durham Motor Club carrying on with their long-term support. The Friends of Kilhope Mine also gave valuable assistance, running the checkpoint at Kilhope. We hope that many of the entrants return at other times to visit the mine properly. It's certainly worth a look. Stanley Motor Club always marshalled Hagg's Bank, Velvet Path in the past. Question - are they the same club as N.Durham Motor Club? Anyone who knows the answer, please let us know! Hadrian Motorsports Club also helped marshal in the past. Westgate petrol station was always crucial to the trial for petrol - now it's no longer open & has been demolished.The route was subsequently altered to take in a petrol station at Alston in 2006. The route is always run by the organisers on the weekend before the actual event to check roads are open, passable, check for fallen trees, flooding, etc. This is now the only chance the club members have to actually ride the beamish, as they are all so involved in marshalling on the day. The Beamish hasn't always followed the same route. Parts/sections have been altered/changed, added, as necessary in the past. The 'speed hill climb' was dropped in 1999 due to it not being covered by our insurance & it being illegal to 'race' on public roads! It may be possible, however, to bring back the section over the moor, but we need more marshalls to do this - anyone interested? A shooting syndicate runs a game shoot near to Velvet Path in Stanhope Dene & we are careful to inform them of the date of the event every year. The Church Commissoners of England own much of Stanhope Dene & we seek their permission to use it every year via their Land Agents. This is a very sensitive area & we ask everyone to respect the land (as anywhere) on the day. We are guests & should act accordingly. The drop into the ford just before Allenheads was put in to try & break up the 'fast' main road approach to the village prior to lunch. The three police forces whose areas we travel through do not support this type of event being held. Whilst they cannot prohibit it as long as we are law-abiding, we ask everyone who takes part, from entrants to marshals to spectators, to totally respect other road users, all landowners & users at all times, & do nothing that would jeopardise our event. 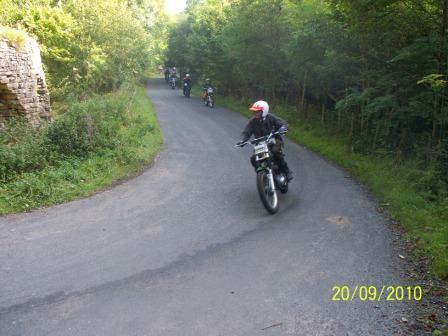 Studdon Hairpins was part of the original Travers Trial in 1920's & is a public road. It gets very muddy & is in deteriorating condition now. It's usual traffic is of the farm vehicle type. The gravel path/road at Dial House is known locally as the Black Road. The gentleman who lives in one of the cottages is a keen supporter of the Beamish & is a very helpful, friendly chap. He doesn't like Sunderland AFC though! Hagg's Bank was a very early Hill Climb event, probably in the Travers Trial. Friends of Beamish actually cut part of the track up the bank. The Hagg's Bank Stewardship Group looks after the bank, trying to keep it open. It is a public road & vehicular right of way. The lower sections are possibly getting more difficult year by year, with loose stones and, in one place, exposed bedrock. It is supposed to be a challenge to all classes of vehicle in the event, and it certainly fulfills this function - possibly a little more ruthlessly than it did 10 or 15 years ago. For cars and, especially three-wheelers, Haggs Bank is passable with skill, a little luck, and a bit of momentum on the corners! Those entrants in vehicles who have not been up before, or who wish to refresh their memories or check possibly changed conditions, are encouraged to walk the course, up to the foot of the last steep section, before they embark. You have been warned! The drainage pipes present a particularly tricky problem for the cars, due to the ground having eroded or being washed away on the downside. There were close links between the Friends of Beamish & the Friends of Kilhope Mine. Kilhope was never included in the Travers Trial. Middlehope was in the original Travers Trial. Scarsite Head junction was the oldest public road in Durham. The original Travers Trial actually turned left at Peat Hill, but this route isn't passable now. Peat Hill was in the original Travers trial also. Newhouse Bank used to slip off to a ford but it isn't in use now. Westgate ford was added into the route due to this. Stanhope ford has never been used in the Beamish as there was no reference to it in any literature relating to the original Travers Trial. Gold Hill was in the original Travers Trial & was one of the most difficult sections at that time. Robert Atkinson was behind the runing of the Beamish for many years, being an integral part of The Friends of Beamish. In the last 2 years before they handed over to Durham Classic Motorcycle Club in 1998, Ian Findley had taken over from Robert & carried out most of the organisation. Robert gave us the benefit of his knowledge when we took over running the event. Without his advice DCMC could never have attempted to run the Beamish. Many of the Friends of Beamish rode old motorcycles (& probably still do so!). Some are involved in restoration of bikes at Beamish Museum. 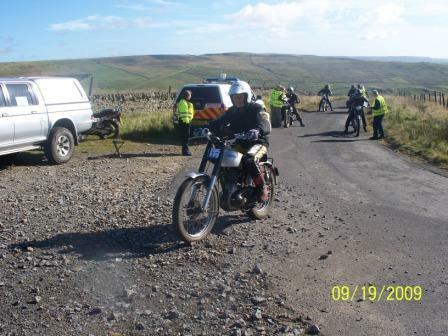 The Burnhope Run was based upon the Beamish Trophy Trial principles in many ways. 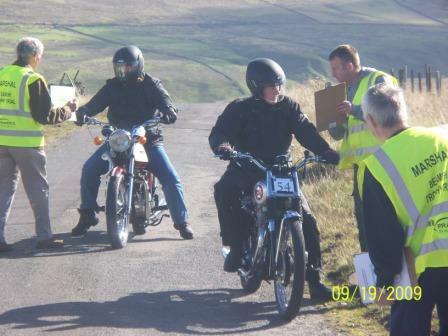 The Beamish Regulations are based upon standard/typical motorcycle trial regs of around 1970. When the Friends of Beamish ran the trial, they never advertised widely for entrants, just sent out approx. 300+ regulations & entry forms. This would have been some administrative task, as there were no computers in those days! How did they manage? If someone didn't enter for 3 years then they were dropped from the mail list! An advert was placed in The Classic Motorcycle magazine only. R.E.V. Gomm Ltd in Birmingham have always provided the badges & date bars. A part-die charge is paid every 10 years. Badges without pins were also ordered to fix to the replica trophies. The Beamish has always been self-supporting & remains so, even though insurance & running costs are high. Breakdown service has always been provided, with a wagon following round up until late 90's which could take quite a few bikes. With the widespread availability of breakdown cover these days, there is much less need for the organisers to provide this. It is still offered, though, with a 'sweeper' (car & trailer or van) following the route behind the last bike/vehicle. They usually have to pick someone up. Recovery is usually to the nearest town/village, though lucky entrants may get back to the start/finish. The key to a successful trial is a good relationship with the land-owners & users, as well as with the entrants. Anyone who has information relating to the early days of the event or who can give us an insight into any aspect of the trial over the years please contact Pete Robson on [email protected] or (0191) 3710866. Many of you will know my family; my dad Eric Dobinson, mum Anne and Uncle (or second dad) Keith Dobinson. I suppose many of you remember my sister, Helen, and I in our nappies at Newby Hall and it will shock you to now learn it is my turn to get behind the wheel of an Austin. <?xml:namespace prefix = v ns = "urn:schemas-microsoft-com:vml" /><?xml:namespace prefix = o ns = "urn:schemas-microsoft-com:office:office" /><?xml:namespace prefix = w ns = "urn:schemas-microsoft-com:office:word" />After two years of driving a proper car I have given in to family pressure and finally, sometime mid August, had a go in Betsy (Austin 10 Lichfield) and Noddy (Austin 7 Gordon England). Little known to me my dear Uncle had big plans to enter me in the Beamish Trophy Trial on the 18th September!
. a little rev with what, my spare foot? Anyway after a couple of miles in each car we called it a day, my nerves and Uncles Keith's were shot to pieces and we just couldn't cope with anymore. The next weekend my glorious uncle decided Noddy was just too easy for me and I should have a go in the tank, sorry I mean his Lagonda. Well what a joke! I could barely reach both side of the enormous steering wheel never mind see over the top of the thing and those gears, it was like mastering the worlds hardest jigsaw puzzle trying to find the right hole to jam the stick in! I think I was coasting most of the way. We then took a wrong turn and got stuck down some little streets in Shildon, narrowly missing a couple of rude modern cars, we made it back to Heighington and decided unanimously that we would stick to Noddy for now. Well the 18th came all too quickly I was terrified I could barely change gear never mind race up those stupid hills but I resigned myself to the fact that I would never be left in peace until I tried it. Being a motorbike trial I didn't have much competition, in fact there were only three cars (all Austin 7s) including me but never mind I was competing with the hills not other people. Im not sure I've ever had so much attention, the looks on the faces of all those men when a young blond female jumped behind the wheel, it was priceless! I did get some extra cheers and waves though in fact I felt like a celebrity. The problem with fame, however, is I always had an audience, how is it you can drive perfectly yet as soon as someone comes over to watch or sticks a camera in your face you stall or start rolling backwards or grind the gears particularly loudly? Well, I managed to get to the first hill in good time, Haggs Mine, just up near Killhope. Mum and dad were waiting with the camera to capture another first, my first hill. I'm convinced dad was more excited about this than my first tooth or my first steps. Now if I could have gone up that hill with my eyes shut I honestly would have done. It was horrific, just stones and rocks and boulders and sharp corners and big steps and well, yeah! you get the idea. But I made it much to everyone's amazement I got all the way to the top and, wow! what a buzz!
. yes beaten by a girl Ha! Ha! Yeah I won, well I certainly beat that guy up that particular hill. Now OK you could say I had a better car or it was down to Uncle Keith's expert instruction but, no, it was my superb driving skills that got me up that hill. Well we finally finished at about four oclock. One hundred and twenty miles or thereabouts and, my god, did I know it, I was shattered, my legs were all wobbly and my bum was killing me. A million and one people came over to me to say, well done, and tell me Id driven well and also ask me about the car. Now I know I drove it but apart from the fact its green and cute thats about all I know, sorry! Now all that remains is to sit at home and wait for the results. I must have done well because I even made it into the Northern Echo, fame and fortune awaits.